The HKU Taster Day programme, which was first launched in 2014, aims to offer local junior secondary students an exciting taste of the unique energy of HKU campus life. Students have the chance to learn from HKU's friendly and knowledgeable professors and experience a range of interesting workshops. 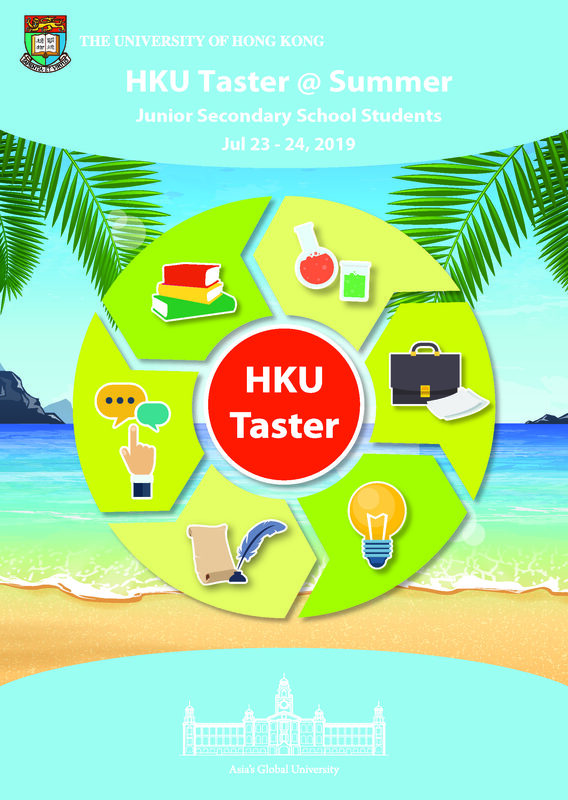 HKU Taster @ Summer 2019 day programme provides a great opportunity for junior secondary school students to experience the vibrant campus life in HKU, while participating in different interactive and inspiring workshops led by HKU professors for students to explore their passion and interest in various disciplines. Please join our Facebook group to know more recent news from HKU Taster as well as information about forthcoming events. Please note that early bird offer is not applicable for HKU Taster applicants. Starting from February 1st, 2018, there will be a $200 fee charged to all applications to HKU Taster programmes. Application fee and Programme fee are non-refundable and non-transferrable. Selection is based on the academic and non-academic achievement of the applicants. Successful applicants will receive a notification by Email with payment instruction no later than June 30, 2019. Please arrange payment 1 day after you have received the notification. Confirmation letter with registration location will be sent to each successful applicant within two weeks after payment is completed. Disclaimer: Programme contents are subject to change without prior notice. *All documents should be uploaded in PDF or JPG format and the maximum upload size of each file cannot exceed 1MB. All file names must be in English. Wherever life's journey takes you, these little memories and friends you have will never be replaced! For summer programmes related enquiries, please email tasterhk@hku.hk .